A few weeks ago, we posted our first edition of the ‘Best Marketing Books’-list according to our own experts. This list was highly appreciated by our readers and that’s why we’ve decided to make a part 2 for you. Today we came up with a new list of marketing books, this time some of only Dutch writers. We asked our webtexttool team again about the most interesting marketing books form our fatherland. So here’s our new list, enjoy and start learning! Rijn Vogelaar studied social psychology and psychological method teachings in Amsterdam. Rijn Vogelaar is former CEO by Blauw Research. He specializes in customer relations, recommendation behavior and social networking. He is now much sought after speaker and founder of the Superpromoter Academy. In the book ‘The Superpromoter’, Vogelaar shows how super promoters and customers, citizens or employees can make your organization more successful. Rijn Vogelaar describes a completely new trend in thinking about marketing, operations and product development. Organizations should focus more on the super promoters. Are you curious about the super promoter and would like to know exactly what a super promoter is? Then we definitely recommend you to read this marketing book. It introduces you to a different way of thinking about marketing. And, maybe this will lead your organisation to success. The writer of this book is Geoffrey Miller. Geoffrey Miller works as a lecturer in psychology at the University of New Mexico in Albuquerque. Geoffrey Miller has a huge pile of scientific publications on his name. The book “Darwin and consumers’ addresses the needs of consumers. Why do people buy what they buy? What has the effect of expensive impractical products in the consumers’ minds? You learn it all in this particular book. Psychologist Geoffrey Miller let’s you see the consumption society from a distance in this book. This book shows you how loose beaten the consumer is, but also how to remain with both feet on the ground. The author of this book is Jan Bommerez, Jan Bommerz mainly works with management teams. He regularly speaks at conferences in Europe and for organizations like KPN, Pfizer, Philips. Do you want to enrich your life with a good book that alongside inspirational stories provides a lot of information and practical exercises? Then this unique book is definitely something for you! In this book you will find yourself regularly. While reading, you will find out how the writer may impede to live fully. This gives you insight to practical work. It gives you an idea of good and honest entrepreneurship. Readers who read this book before describes this book as clear, feasible and inspiring. This are some reasons why you certainly should read this book. 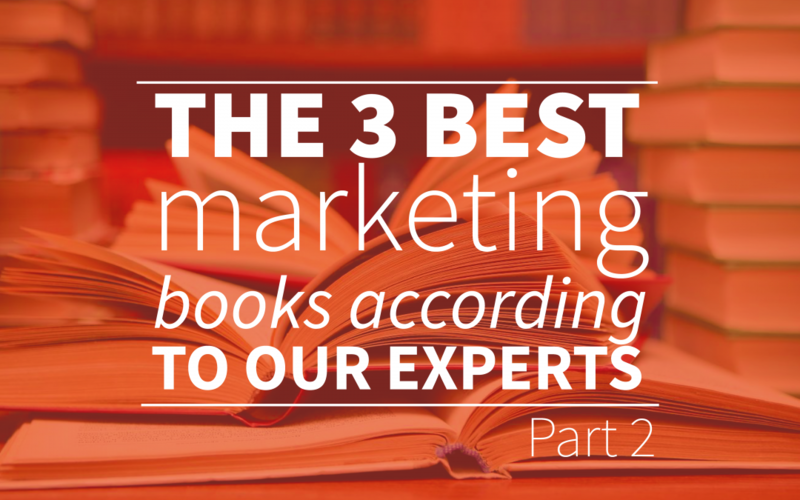 These are the three books that you definitely should read if you are interested in marketing. They inspire our team every day and we hope you’ll find a new favorite marketing book from our list! Want to know more about our list with English marketing books? Please go to our article about English marketing books.